Share The Love | There is A Big Fish Out There! Ok, seriously, a familiar story to many, believer and non-believer. The main message of this book is, God's mercy, grace & compassion toward the lost. Ever wonder why God pursued Jonah relentlessly? God says, Jonah go right and Jonah goes left. To paraphrase, Jonah, "go to the Assyrians", "go tell the people of Nineveh about me". Jonah seems to think that somehow he has escaped God's presence, but God sees all. So, the Lord meets Jonah and pretty much says, Jonah you can't escape me; now look around, you are about to get these people on this boat killed. Therefore, it's best if they just throw you overboard so that you won't have their blood on your hands too. Now go and warn the sinner ( Ezekiel 3:18) Overboard he goes, and the Lord scoops him up...ok..he is swallowed by a fish...a BIG fish! Jonah, a prophet, a member of God's chosen people; what is wrong Jonah, don't you want to share the love? 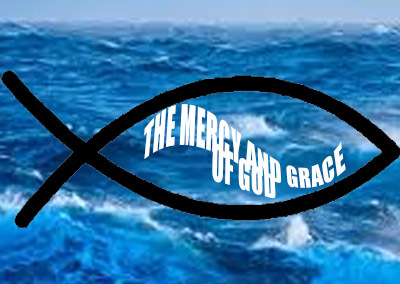 Jonah knew of God's mercy, grace & compassion (Jonah 4:2), so what's causing your heart to panic, Jonah? I'm not defending Jonah, just empathizing. I know we can relate, can't we? God speaks and we act like we did not hear him. He asks us to pardon someone who has caused us grief and we say, "surely not I Lord", you see what they have done, as if God was blind and deaf. Perhaps we really haven't learned to fully accept God's forgiveness. It's in that state of freedom; that sweet spirit of forgiveness that we want to run out and share it with the world, isn't it? While Jonah is running, God is working. It's the heart of the Shepherd that draws us, it's that same heart that follows us all the days of our life (Psalm 23:6). The message to be delivered was as much for the Ninevites as it was for Jonah. Ironically, the heathen nation, the ones who had no relationship with God; the instrument that God had used to teach his own about repentance, they are the recipients of this mercy; they are the ones who respond quickly. We read that the king took of his robe (I guess his robe was filthy and he needed a better covering- Hallelujah), covered himself in sackcloth and sat in the dust (Jonah 4:6). But Jonah, where are you? Jonah is whining and complaining; he has the nerve to be angry; angry at who? Is as if Jonah says, you're going to pardon them; have you not seen the grief, the pain they have caused, have you? Jonah, had unsettled issues. He had not fully grasped the heart of the Father. He somehow had redefined for his own purposes what mercy and grace should entail and to who it should be extended. God, I'll tell you who should get some of that mercy & grace, and I'll also tell you how much; you can't just let them get off so quickly. Mercy & grace belongs to God, he holds it, he dispenses it and always when we don't deserve it. Jonah has somehow missed the message God had been revealing throughout the ages. God had even called Jonah to be his mouth piece, but somehow he missed it. Had Jonah experienced God's forgiveness for himself? If so, why isn't he ready to tell the world, a world full of sinners about his mercy & forgiveness. The Lord was showing mercy to the "instrument of destruction (Assyrians)". If forgiveness could somehow be extended to the enemy, Israel's enemy, how much more to you, my people..... listen Jonah, I'm speaking to you. But Jonah wants to die instead. Jonah prefers to die than to see his enemy forgiven. What a contrast! Jesus wants to die so that his enemies can be forgiven. Jonah & I, perhaps even you, still have a lot to learn about God's immense love for people, sinners, those who dismiss God as if he does not exist or as if he does not see when we are running from him. So let's go, share the Gospel, share HIS love before a BIG fish gets us! I was young in the Lord when the Lord whispered to me. When I got saved I was about 26 years old, my son was just turning 5. I woke up in the middle of the night and could not go to sleep. I could not shake this "feeling" that I should be doing something but I did not now what. I remember I walked to the dining area near the kitchen and kind of cornered myself near the wall and kept asking God; "Lord what is it, what am I supposed to pray for"? I was young, I did not fully understand how God spoke ( the truth is sometimes I still miss him). I began to call on the Lord and do what I knew best....to pray...I prayed for everyone I could think of; family everywhere and then I think I went back to bed....I can't even remember. BUT, what I do recall is finding myself in the kitchen area again; God would not let me sleep. Surely, I would know what God's voice sounded like, right? God is so Good! Every time I lack, he is more than enough. His gentle Spirit continued to move me to stay awake and alert. After some time, when I figured I had done all he asked me to do.......a whisper....yes, a gentle nudge....almost as if the Father said, "Walk this way". Remember, in my mind, I was all done, ready to go to sleep. I began to walk to my son's room, even wondering why I would even go in that direction. But God knew. As I walked into my son's room, now clearly in the middle to the night; everyone else is sleeping....I took a few steps to check on my little boy. Never would have I imaged what I saw. My son sleeping, a little innocent life, just waiting for his mother to obey the "voice of God" as he warned me to check on this child. You see, somehow from above his bed; he had a radio that he would listened to often; the radio electrical cord that was pluged into the wall somehow had managed to wrap itself around my son's neck. Yes, the whisper...though I missed it the first time....I did not really understand how the Lord spoke...I was young; yet in his mercy he knew how to reach me, how to keep my attention...his Spirit ministering to mine, until I obeyed and uncovered the danger that lied right in my son's bed. I quickly, while trembling and with tears pouring down my face ....unwrapped the cord from around my son's neck. Of course he woke up...startled, for he too was unaware of what was happening. I went back into the bedroom and woke up my husband and began to tell him of God's warning; how he had spoken to me; how he had showed us mercy that night. I would like to say that I always hear him and that after that night I have never missed a whisper, but that would not be the truth. I walk this life and have surrendered myself to him, sometimes like Elijah, a powerful man of God who after God had used him in such a miraculous way, found himself running and afraid. As the word of God came to Elijah and told him to stand on the mountain; I wonder what Elijah expected? God was not in the wind, the earthquake or the fire. God came in the gentle whisper and Elijah covered his face at the Presence of the Lord. Yes, it's humbling to know that God would come out to meet me, even after I missed him. It was encouraging to Elijah to know God would strengthen him again even after he had cowered. I remember running to my bed with my son and now my husband awake too.....opened up his Word and read, I will praise the LORD, who counsels me; even at night my heart instructs me. Psalm 16:7. So, today, listen....listen to the Spirit of God; our Comforter and instructor; the one sent by the Father and the One who testifies of the Son. Not sure if you recognize his voice....go to the Word...sit and talk with your Father....then wait and listen. Just like talking with a Friend, "can you say that again please, I'm not sure I understand". Father, help us.